Woke up this morning, crushed a nail with my bare feet. It didn’t hurt honestly. I showed that nail who’s boss. Went downstairs and decided not to have my usual bowl of corn flakes, not because the box was empty, that’s beside the point – I actually felt like eating dry toasted two week old bread, that’s the kind of man I am. After a quick cold, but bracing, shower and shave (I cut myself a few times, on purpose you understand, helps me focus) – I took a lovely stroll down Downing street to meet my friends. There were some people at the gates, shouting empowering remarks like ‘Clegg’s a two-faced liar!’ – well the joke’s on them: everyone knows that two faces are better than one. Spent the morning analysing opinion polls. Some people can be so negative can’t they?! I’ve said it before and I’ll say it again – everyone who is about to jump up high needs to bend their knees close to the ground at some point. The lower the better I say! It shows we are a serious party of government, a party who isn’t concerned with popularity, or consistency, or even honesty! That’s what people want from modern politicians, isn’t it? Narrowly avoided a few eggs on the way to dinner. Idiots – they’ll be sorry when they get home and realise they haven’t got any eggs! Ordered a tuna salad for my lunch, got chicken soup – excellent! I didn’t even realise I wanted chicken soup until it arrived on my table, how nice of them to second guess me. Cold as well. Just the way I like it. Saw George and David this afternoon. Said they wanted to run some policy ideas past me. Which they did, quite literally. They took turns waving a piece of paper in front of my face so fast I couldn’t see it, saying things like ‘what do you think Nick? Can we take it you’re onboard?’ at one point I managed to grab it from David as he was spiralling around me. He just grabbed it back and shouted ‘MINE!’. Then they both left and thanked me for my input. Those guys. Can’t wait to win the next election. All set now. I get so many emails, it’s a near-certainty. I never read them though, that would be crude. Same as I never read the papers or watch the TV or listen to the radio, and rarely leave the house – or take calls from my party colleagues. I don’t want to dilute the message you see. It’s best to stay isolated and completely unaware of the outside world if I’m going to ride this wave of popularity to ultimate power. That’s what George and Dave say anyway. Got home. Wanted to watch ‘Come Dine With Me’ but my wife didn’t let me. That’s fine. It’s only my favourite show, nothing to worry about. Spent the evening re-watching my sterling performance on the televised debates from 2010. I wiped the floor with them! It’s no wonder I’m now the most popular coalition deputy prime minister in almost thirty years – you can’t argue with them arrows. Anyway – off to bed, well the sofa (it’s quite comfy actually) to dream of being Prime Minister. I hope. Sometimes I have this nightmare where people think I’ve betrayed their trust by breaking my promise on tuition fees and propping up a vicious Conservative government that I could stop at any time by withdrawing my support, and that I’ve dragged the future of my party and its ideals into a near-abyss with little or no hope of redemption – that I’ve literally contributed directly towards the dilution of democratic choice in this country that is leading to widespread apathy, mistrust and disenchantment with the whole political process. But that’s just a nightmare. I know it isn’t real. People love me. 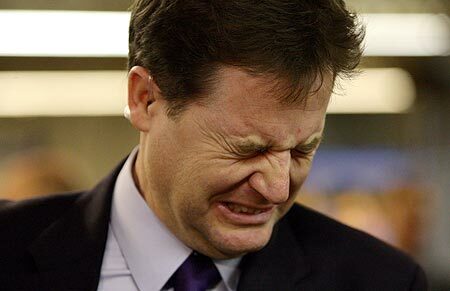 Nick Clegg was to go on to become the first deputy Lord Emperor of the Universe where he strongly opposed the subjugation of all species, but really didn’t have the influence to do anything about it. Very pleasing, although i’m suspicious about the methods you used in order to spy on Clegg. Did you employ surveillance equipment or just retreat behind bushes and furniture? The social document you created though is worthy of Samuel Pepys diary! I told him I was from ‘Going Live’ and that we were doing feature’s on up and coming world leaders. He hasn’t had outside contact with the world for so long he though I was Philip Schofield. I also squeaked a dog toy in the background a few times and he was convinced it was Gordon the Gopher – after that he was mine. Easy really.